@naumangul7 with last night projector installation, the total is around 140k. @hassantahir2 I will post pictures. I am not sure about caster angle as well. Need guidance. @Hassan1991 Car isn't lowered. I can't drop it from front as the engine guarder is much lowered to fit the engine in engine bay. Initially, the car had 155/70 R13 in front after engine swap and the engine guarder was kissing every bump on road that came between the tires. I than changed tires to 155/80 R13. Now its fine. I will drop it from back. and also share engine bay pics... i can see hood lifted. I've updated full story including most of images I have. Reread it. your mechanic didn't managed it. now you need to do a lot of work to done it right. difficult work but you problem of ground clearance will be solved. Brother, I am sorry to learn about your invaluable loss. May Allah grant her Paradise and give you sabar. It is appreciable you braved up to share your story with us. Congratulations on starting your life all over again. And this is a nice car and nice restoration. Hope you enjoy the hard work put into reviving this beautiful car. Do foundations need to be repositioned? What is this thing called? Engine guarder? When you lift it up your Intercooler will came way out of bay. So relocate it keeping in mind that intercooler need fresh air otherwise there more loss then gain. 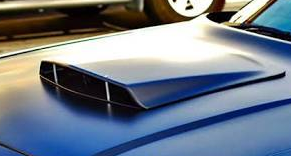 The intercooler placement is wrong in your case as you don't have any hood scoop so that intercooler is not doing anything good you have to move that to front of car where it can get some air..
Yup that is called the engine guarder. For AC i will only suggest you to get a Multiflow condenser and a good condenser fan that helps alot with performance of AC. Add some more thing's to your list which i can see. Indicator cover on right fender is installed wrong correct that. Why have you installed a Mehran's side mirror on driver side stock Khyber one's are atleast better than that. The front radiator support also known as gardery needs some attention i can see some rusting there. You should install front fender shields if you don't have them. They will keep the shock tower's a bit safe from rusting as i can see some rust near shock tower's. Battery hold down should be installed to secure the battery at it's place. Engine should have been placed higher. It's way too low. You know it's Pakistan, and has all types of bumps, speedbreakers etc. 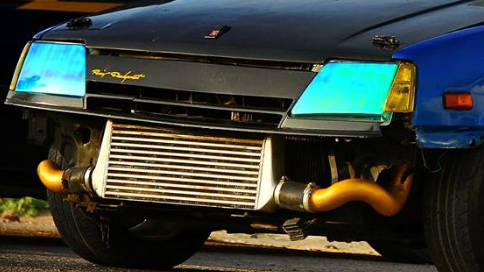 If intercooler made the fitting difficult and engine needed to be installed lowered due to that, this type of thing should have been done with engine installed a bit higher, and this is necessary for turbo intercooler anyway, unless intercooler is added to the front. It would have added a pro look to it also. Consider installing a strut bar also for extra rigidity of chassis, frame etc. I have that Khyber one, it gives less view. I searched for curved mirror in Khyber type but couldn't find. These Mehran mirrors look weird with Khyber. I am still searching for other options. Car gets heated up when I push paddle hard in a hot sunny day. I am considering changing radiator. There no space for bigger radiator. I don't want to go for the same type. Its 2 naali radiator. Can I get 3 naali fitted there? I have damaged one. I will replace. The other way around seems fine, to reallocate intercooler to front. 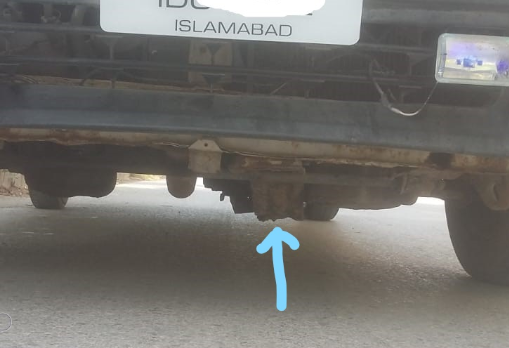 Do consider Corolla 86 or some relevant mirrors i guess those can be installed in Khyber with some minor changes..
BTW have you got the gauges calibrated if you are using the stock gauge cluster. 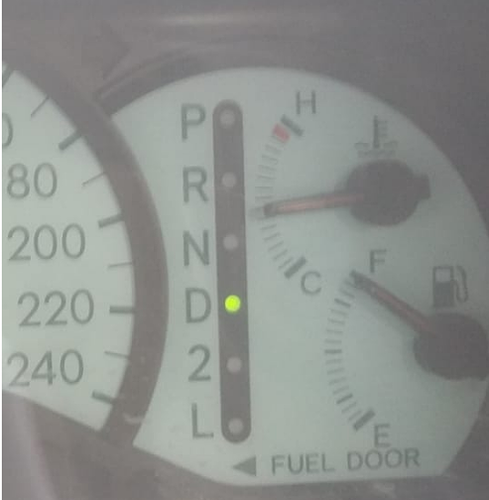 That might be only gauges fault. Front mounted Intercooler is useless without tuning the ecu. These are hard-core ecu you can't tune them. I've changed the speedometer from 240 to 180 now as that was showing wrong speed. 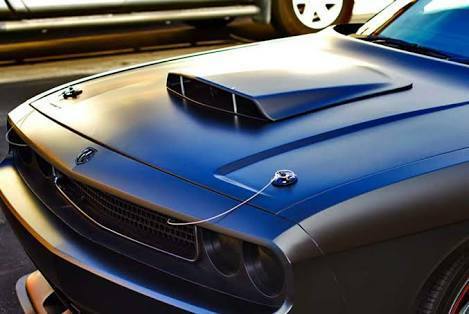 Do we have ECU tuning service in Pakistan? I am sure my car needs that as the electrician randomly tried different ECUs and fitted the one which worked. yes. but only when ecu is chippable or you have to chip it. seriously!! no stock ecu?? then how n/a ecu is handling boost? May be he had 2, 3 ECUs for k10 turbo. We got complete wiring with engine including ecu.